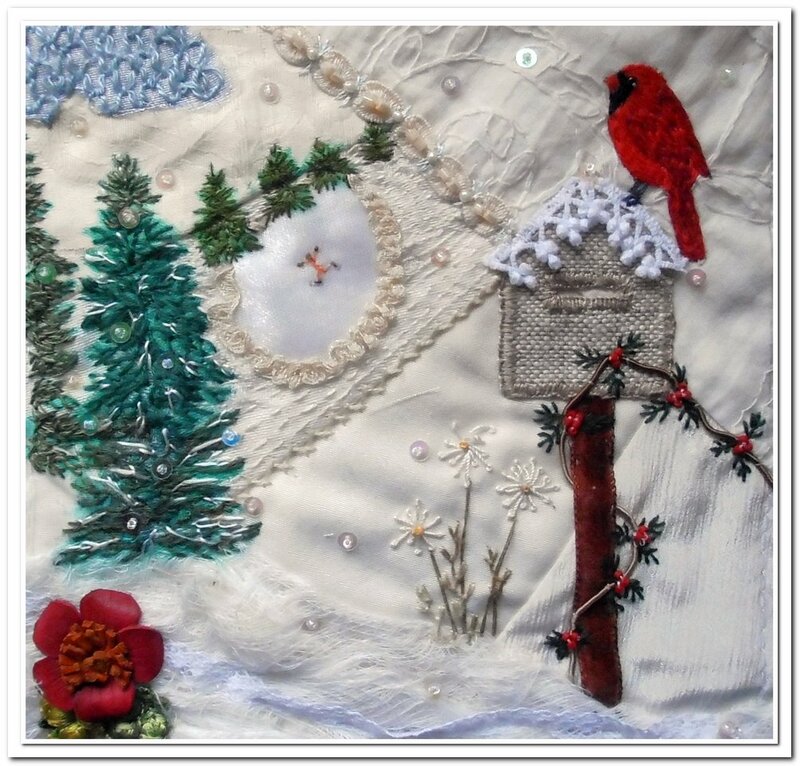 My red cardinal called for a winter scene – looks quite cold. I tried a few different things this time. First I stamped the trees and then Feather stitched over them. The Cloud filling looked wrong on the white fabric so I fused chiffon down and re-did the stitching and also fused a chiffon type fabric for the ice pond. I added Running stitch on the pond patch. The foreground snow is loose laid scrim. The photo doesn’t pick up the 3D effect but it looks good in the hand. The red flower was given to me this week and surprisingly, is made of leather. The work began looking like a cliff at the scrim edge, and downward to the skater but seems to have altered definition here. Why there would be a letterbox at a cliff edge is not for me to explain. I’ve seen a small amount of real snow, twice in my life and rely on pictures of winter for inspiration..needless to say this came from my imagination LOL. Thanks for your comment Sharon. Much appreciated. Your usual exquisite work Maureen. I want to be you when I grow up. but I do thank you for the lovely compliment. I think you’ve captured snow quite perfectly! We get altogether too much of it here for my liking and I must say I far prefer to see the stitched version.